(Bloomberg) -- Citigroup Inc. is warning that investors should brace for a pick-up in turbulence next week, which will be packed with global economic data that could make or break the market’s thirst for risk. 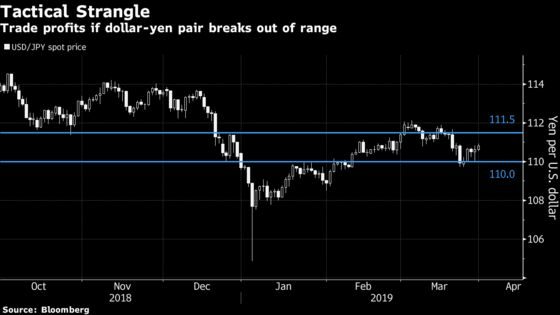 To position for what could be either a “hefty bounce” in risk appetite or a further darkening of the global economic outlook, Citigroup strategist Calvin Tse recommends an options wager on the dollar-yen currency pair, which has a tendency to move along with global risk sentiment. By owning a one-week call on the pair at 111.50 and an equal-sized put at 110 -- at a cost of 32.5 basis points -- investors can benefit if dollar-yen breaks either above or below that range. The pair was around 110.77 as of 2 p.m. Friday in New York. Next week “will be crucial for the macro world,” Citigroup’s North American head of Group-of-10 foreign-exchange strategy wrote in a note to clients Friday. 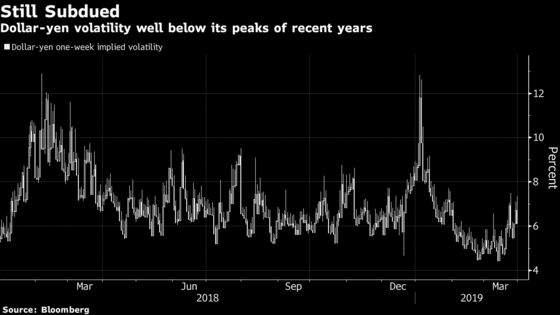 With one-week dollar-yen implied volatility near the lower-end of where it has been in the past couple of years, a so-called strangle position is an attractive way to bet on “potential outsize moves in markets,” according to Tse. In the span of seven days, global markets will get updates on how manufacturing is performing in China, Germany and the U.S., as well as readings on American jobs and retail sales. Friday’s U.S. employment report will be “especially watched,” given last month’s surprisingly soft print, Tse wrote in a note to clients. Next week also marks the start of the new fiscal year in Japan, which should also bring volatility as new capital is put to work, he said. Dollar-yen volatility isn’t currently reflecting hurdles on the horizon, and they will “will drive the near-term risk outlook,” according to Tse.